Business requirements are a tool for documenting your business solutions for driving higher value in your company. In Elements you can raise and manage business requirements independently as well as in the context of the process diagrams, org and ref models. Any user (including free viewers) can raise requirements and collaborate on them using comments in a PRO space. 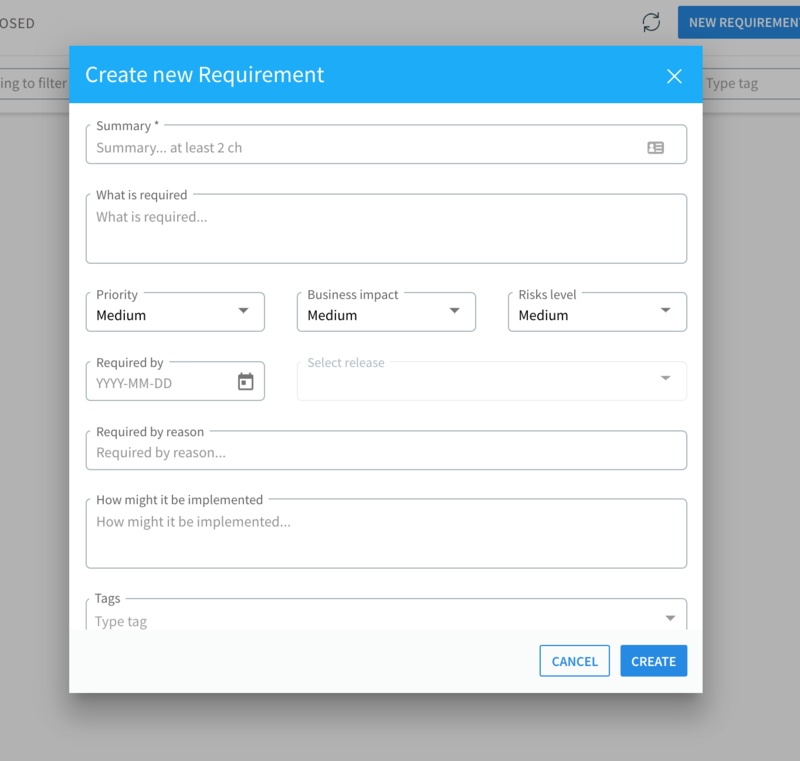 However, in order to manage requirements through the full lifecycle, prioritize them in the release schedules and enrich them with user stories, you will need a requirement manager permission. Anyone can "raise" a requirement. In the main application select the "Changes" menu item and then click on "New requirement" in the upper right corner of the screen. In the dialog you can specify your business requirement, i.e. the problem being solved, the proposed solution as well as target release, priority, impact, risk etc. When ready, hit "Create". 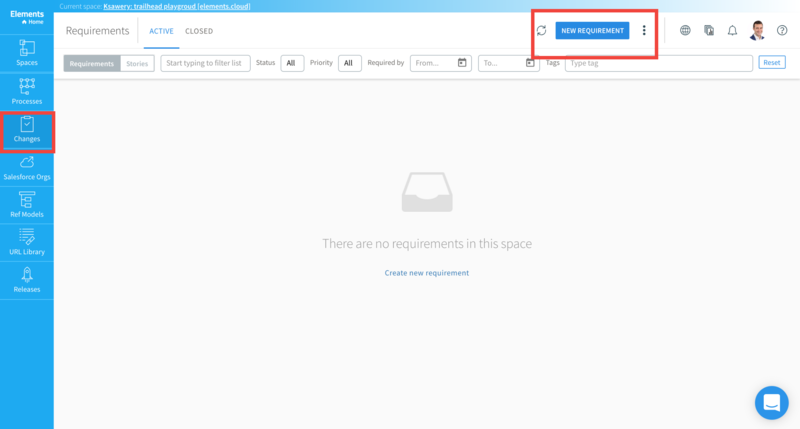 At this point a requirement is in "Being raised' status and this allows you to add any additional information, like notes, links, data tables, images, or even change the requirement details, in the right panel. Once you feel the requirement is ready you can click "Change status" in the right panel and change it to "Submitted". From this point only a requirement manager can manage the submitted requirement. A requirement manager is responsible for assessing, consulting, and implementing the submitted requirements. They can edit it at any point during the cycle, specify actionable user stories for a requirement and link it with process activities or model nodes. The image below outlines the default business requirement lifecycle. The requirements with statuses: "Implemented", "Deleted", "Will not implement" and "Duplicate" will be put in the "Closed" category list so you can concentrate on the ones requiring action. There are also many possible use-cases for raising and managing requirements inside Elements. At any point you can report on the filtered list of requirements to generate a filterable spreadsheet with all your data. You can also report on all raised requirements in the scope of the process map or reference and org models. Click here to learn more about reporting inside Elements.cloud software.